Ultraman Retsuden 1 HD released! Thread: Ultraman Retsuden 1 HD released! Get it now! Ultraman Retsuden episode 1! 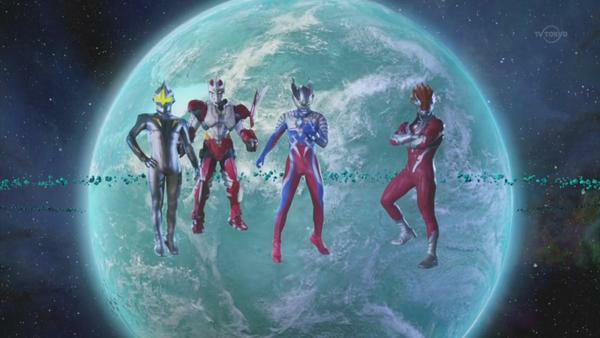 Ultraman Retsuden stars Ultraman Zero, the new Ultra Hero, as the navigator of this show. He'll take you through the 45 years history of Ultraman. It will be a special compilation of the various Ultra Heroes and monsters. Heisei-verse Ultra Heroes will guest star in "Retsuden" namely Hiroshi Nagano aka Ultraman Tiga, Takeshi Tsuruno aka Ultraman Dyna, Takeshi Yoshioka aka Ultraman Gaia, and Taiyo Sugiura aka Ultraman Cosmos. More is said to come in succeeding episodes. So did you guys stop doing Retsuden? Yes it is cancelled, it's clearly stated on the thread.